In a bowl add lemon juice, honey and chili flakes. Mix to form a paste and add all fruits. Coat the fruits with the paste and add salt in the end. Take skewers and put all the fruits in it. The fruits can be arranged as per colours. 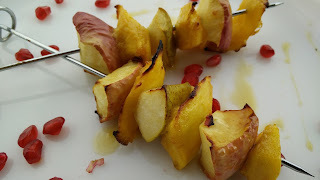 Put the skewers in preheated airfryer at 180 degrees for 5 min. Once fruits are grilled, plate the skewers and garnish with the lemon paste and pomegranate seeds. I tried the air fryer to fry french fries once but they did not turn out to be so great. It was some other company. Does the phillips work fine? If yes, I will buy this one.